Is a sub-4:00 marathon your goal? Are the tips for breaking this marathon barrier any different than for breaking 5:00, or 6:00? Yes, and no. The training tips that work for the fastest runners often work equally well for those of you towards the back of the pack. Thus, if you have a Personal Record of 4:05 and need only a little improvement to snip five minutes off your time, I can help—and so can my followers on social media. Recently I posted a request on Facebook to find out what training tricks worked for those whose PR’s are 3:59:59 or better. Here’s what my Facebook fans told me. Train faster: Interval training, tempo runs, hill repeats, fartlek are among the methods you can use for achieving speed. Sheri Sadler, 50, a paralegal from Scottsdale, Arizona, says, “Push yourself. Running a too-easy pace won’t cut it. Get out of your comfort zone.” Sadler had a string of 4:20-plus marathons, then got serious, aiming for negative splits in long runs. She now has three sub-4:00’s and is heading to Boston for the second time. Plan ahead: Stewart Mackay recommends that you go into the race with a plan. “Devise a race strategy, which allows you to start slow and finish fast.” Stay on schedule for your plan all through the race. Partner up: Seek support from other runners. Tania Conwell, 37, a registered nurse who works in Philadelphia ran that city’s marathon with an American Cancer Society team, says, “Adding meaning to the miles made them fly by.” Consider also joining a pace team, she advises. 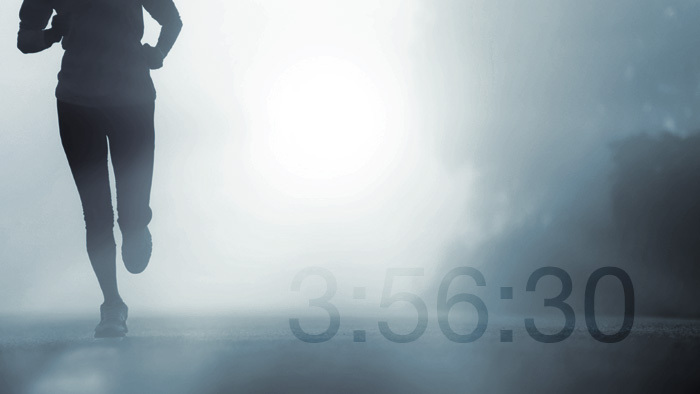 Hal Higdon’s latest book is 4:09:43, about the Boston Marathon bombings. Pre-order a copy here.